Front flap description: Spend Valentine's Day with Snow White and the Seven Dwarfs. Celebrate the Fourth of July with Buzz Lightyear and the rest of your friends from Toy Story. Go along with Nemo on the first day of school. 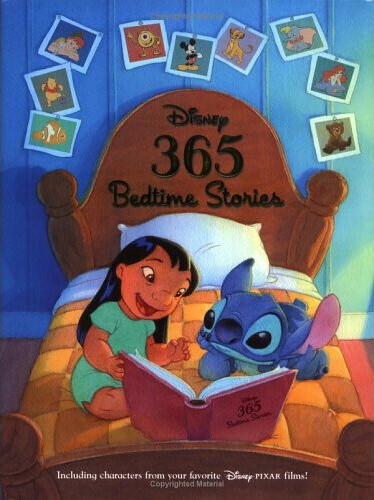 Join Lilo and Stitch as they struggle to stay up till midnight on New Year's Eve----plus 361 more stories, one for each day of the year. This charming collection features characters from more than forty of your favorite Disney and Disney · Pixar films. GMD mention: Page 69- March 7, "A Lesson in Confidence." Considered a small deleted scene from the movie. It's bit of dialogue between Dawson and Olivia while Basil is out of the room. Olivia lacks confidence in finding her father while Dawson tries to convince her otherwise. Page 132- May 9, "Dawson Takes the Case." While Basil is looking for clues in a brick wall, a lady mouse approaches to ask for his help in finding her missing son. Basil informs the lady he is already on a case about the queen and can't help her. Dawson, in turn, offers his assistance. Page 200- July 16, "Child's Play." Basil is caught and tied in a shack full of thieves whom had just robbed the Mouse Bank of England. Page 265- September 19, "Basil's Blunder." A young boy arrives at Baker Street with news for Basil. He tries to tell him what it is, but the detective repeatedly interrupts him when trying to deduce everything about him. Page 330- November 23, "Surprise!" Basil suspects something strange is going on within his own home and begins to investigate. Copyright © 2004 Disney Enterprises, Inc.